Isn't this the best title for a quilting book? 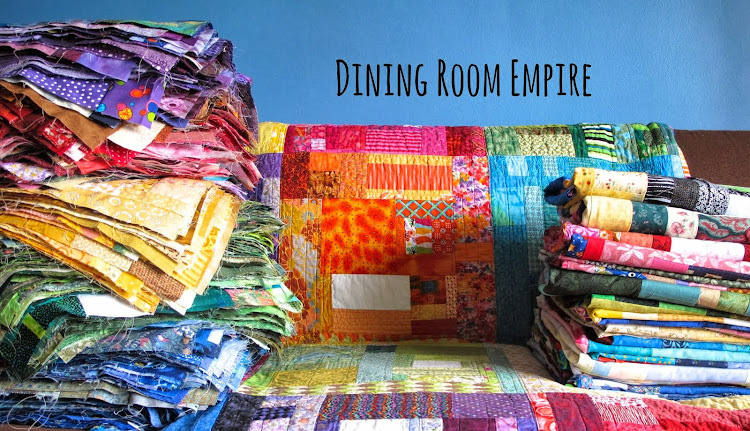 I know it goes without saying for most of us that quilting makes us happy. But it can also frustrate, intimidate, and suffocate. Even I know that. So I'm pleased today to be sharing this book, Quilting Happiness, written to bring even more joy to your quilting. 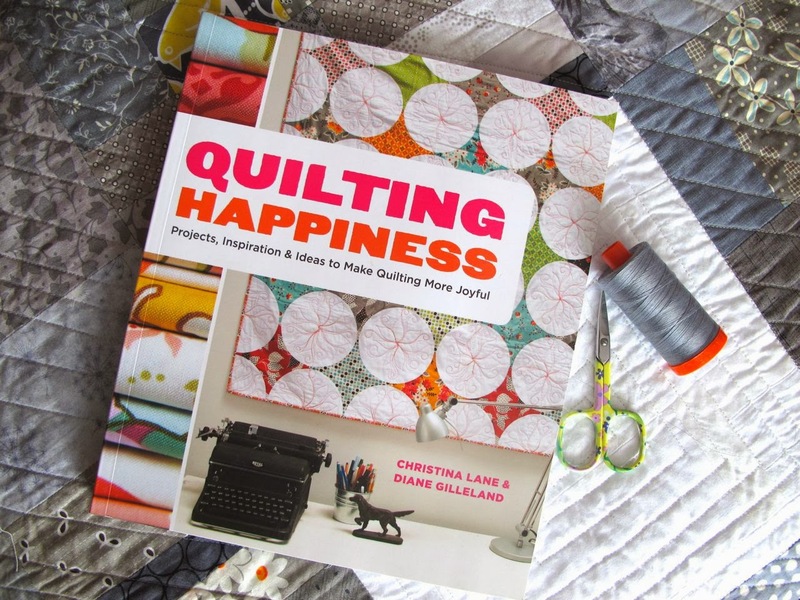 Christina Lane and Diane Gilleland have done a wonderful job capturing the happiness quilting brings - from the creation to the giving, from sewing something you love to sewing for others. And there are patterns. Two things make this book stand out - Creative Exercises and Happiness Practices. These one pagers are littered throughout the book, leading the reader through some personal reflection. Asking the reader to examine their own inspiration, habits, and joy is a wonderful way to get us to stop and reflect on quilting. Sure, we all want to barrel through to the next project, the next stack of fabric, but taking a moment to pause and examine the practice of quilting for us as individuals is worth more than cutting up fabric. I, myself, have stopped to examine my practice as instructed in the book. For instance, they describe a Morning Seeing exercise. In this you write down what the first five things are that you see every morning for a month. In doing so you can pick out the patterns, pay attention to the routines you have, and train yourself to be an observer. Me, I'm a bit of a pessimist so I always see the mess first! That means I've been tidying more before bed and it makes my morning more positive. Which makes that creative time for me more productive and peaceful. 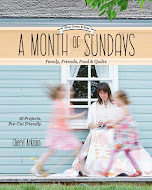 And there are patterns in the book - large quilts, mini quilts, and small projects. The instructions are detailed and leave nothing to question as far as I can tell. Christina is a stickler for details so this is not surprising. I've made one project inspired by a quilt in the book. And that chevron pattern pictured above is next on my list. 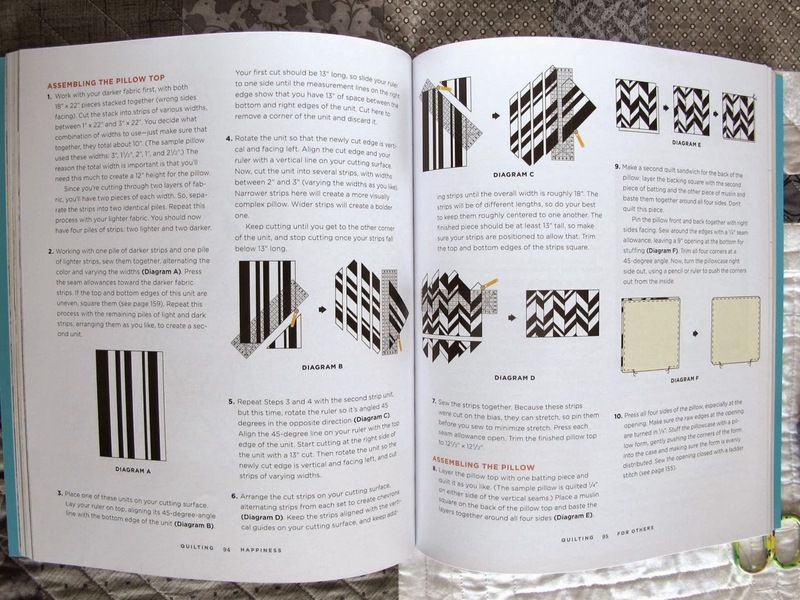 I will say that I wish a quilt book could be written without patterns though, because I think the strength of this one in particular lies in all the non-pattern stuff included. A book focused solely on creative exercises and personal exploration for the quilter could be quite intriguing. There is a lot of that in this book and for that reason I would recommend this one, even if you never made a pattern from it. Thanks for the tip on the book. I'm a reader so I'll love this one. 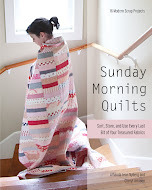 That's why I like Sunday morning quilts so much. So much to read and think about. Thanks. I'll keep my eye peeled for it. I am in a more reflective time it seems. I like the exercises you mention, especially the five things. It's important to me to remember the joy I feel when I create and not let it get overshadowed by insecurities that surface sometimes when I am sewing. This post made my whole week, Cheryl. Thank you so much for this deep review. I'm so happy you enjoyed the exercises. 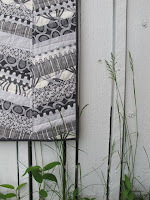 I so agree - quilting has incredibly rich possibilities for reflection and self-exploration. I'd love to see more books exploring these aspects. I love your pillow take on the Crazy Strips Quilt!